I’m working these days with Mellanox Switches, which I think they are awesome because, thanks to the Spectrum ASIC, these switches provide low latency, zero packet loss, and non-blocking traffic. In fact, it’s one of the first manufacturer I know with 400 GbE interfaces. I mean, one network interface at 400 Gbps. It’s amazing. In addition, Mellanox switches support the RDMA over Converged Ethernet (RoCE) technology which is a great benefit for Hyperconverged Infrastructures (HCI). Once they are installed, it’s time for network configuration. I’m right now thinking about clustering and I’m also looking for the best technology to deliver high throughput. I’ve already written about Multi-Chassis Link Aggregation (MLAG) and I think this will be the best technology to configure a clustering of switches with high throughput. MLAG is a non-standard protocol which is useful to create port groups between switches of the same vendor. We can create LAGs to servers from different switches. Therefore, the MLAG technology is recommended for high availability and high throughput. Maybe, if you know Cisco, you are thinking about Cisco Nexus vPC. This is also a great technology for clustering switches where we can create Link Aggregations (LAG) between two switches. In addition, switches keep control planes separated thus better performance is delivered. However, Cisco Nexus vPC is a Cisco specific protocol which can’t be configured in other kind of switches. At a first glance, MLAG and vPC is the same. Both are able to create Link Aggregations (LAG) between two switches and both are managed and configured independently but they are not really the same. For instance, MLAG is easier to configure than vPC because MLAG concepts are the same in all platforms while vPC is a vendor technology with their own concepts. In addition, MLAG mainly enables Layer 2 multipathing while vPC enables Layer 2 and Layer 3 multipathing. However, if we want to enable Layer 3 multipathing, we could also use the Multi-Active Gateway Protocol (MAGP). On the other hand, stacking is a well-known technology which is useful for an easy configuration of switches because all switches can be configured from an unique point of management interface. Thus, there is only one management plane. 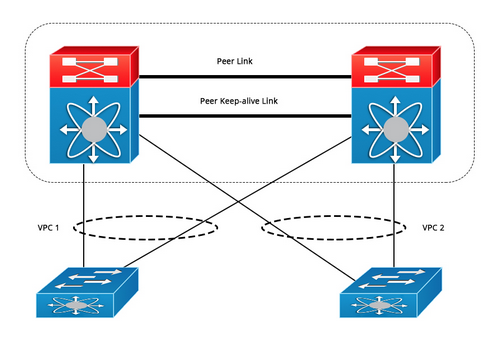 In addition, the stacking technology is able to create Link Aggregations (LAG) between switches like MLAG and vPC does. 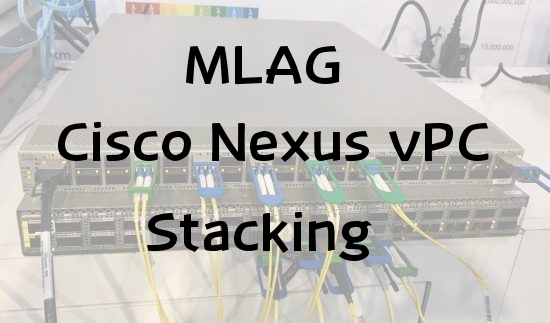 However, there are much more limitations in the stacking technology than in the MLAG or vPC technologies. For instance, there is always a limited number of switches that can be added to the stack. What’s more, it’s not able to stack remote switches which are geographically separated. Therefore, stacking makes sense for the edge of smaller sites while MLAG or vPC make sense for the core or distribution layer. To sum up, there are three types of technologies to create Link Aggregations (LAG) between switches to servers. 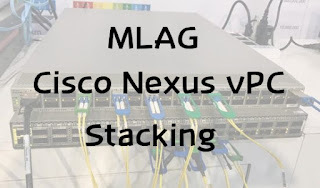 MLAG, vPC and Stacking. Which one to choose? It’s up to you. Keep learning and keep studying my friends!! Any comments are welcome.